Discussing grand corruption at the 17th IACC. What is “grand corruption” and how can it be combated on the domestic and international levels? Is it only about the amount of money or also about the corruption’s quality? 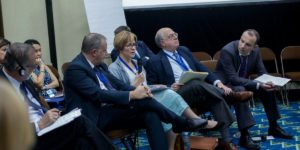 These questions were raised during the panel “Willing and Able to Prosecute Grand Corruption” at the 17th International Anti-Corruption Conference in Panama. According to Transparency International, grand corruption is the abuse of high-level power that benefits the few at the expense of the many, and causes serious and widespread harm to individuals and society. It often goes unpunished, and is globally relevant, not only in individual countries but across borders. Ukrainian lawmaker Yegor Sobolev recalled the case of Ukrainian oligarch Dmytro Firtash. Firtash, who is currently living in Austria, was charged in a US corruption case concerning alleged bribery in India. Now, Firtash figures in a case regarding bribing German policemen. “We need an international anti-corruption system, not only for Ukraine or Guatemala, because there’s an interest of all countries,” Sobolev concluded. One mechanism to combat grand corruption that has seen some success is the International Commission against Impunity in Guatemala (CICIG), headed by Colombian prosecutor Ivan Velasquez. CICIG was established in 2006, after the United Nations and Guatemala decided to set up an independent institution to support the prosecutor’s office. The Commission achieved spectacular results. For instance, one of the Commission’s investigations led to the resignations of Guatemala’s former President and Vice-President in 2015. “We all know that corruption is a global problem that uses a global network, and therefore it needs a global response,” Boston-based federal district Judge Mark Wolf emphasizes. Moreover, corruption breeds constituencies for terrorists and drug dealers, as well as destabilizing many countries, such as Ukraine. Wolf’s proposed solution is the creation of an international anti-corruption court that would work on grand corruption cases from different countries. Panelists also noted that international cooperation must be combined with domestic efforts. National legislative changes are extremely necessary, legal advisor of the Ministry of Foreign Affairs of Italy Giovanni Tartaglia Polcini says. According to him, during the last 20 years more than ten important laws for fighting mafia-related corruption were adopted in Italy. Among the most important steps, Polcini cites the removal of lawmakers’ immunity in Italy and independence of prosecutors and judges. “We should do our domestic job, but at the same time we, all as independent nations, will not be able to be effective without the international anti-corruption community and international anti-corruption system,” Ukrainian MP Sobolev emphasized. Kateryna Kapliuk works as a journalist at Radio Free Europe / Radio Liberty. In February 2014 she became a member of YanukovychLeaks. She also worked at the Ukrainian service of Deutsche Welle, investigative journalism agency Slidstvo.Info, Ukrayinska Pravda, Forbes Ukraine and Kyiv Post. She was the finalist in contests organized by Polish Journalists Association (2015), Reporters Foundation in Warsaw (2011, 2012) and winner in the Second Annual US Embassy Investigative Journalism Competition (2012). Graduated from the National University of “Kyiv-­Mohyla Academy” in 2011 with a major in Journalism.